Using Layar Vision, layer developers can attach virtual augments to a target object in the physical world. If you are new to the concept, please check here for some general introduction. A virtual augment is a digital model (2D or 3D) rendered on a target object as seen through the mobile phone camera lens. A target object is a physical or digital visual entity that contains enough detail to be unique whereby a person can point their phone at said “object” to see the augment (if available). The connection between the virtual augment and target object is done via uploading a reference image of the target object to the layer publishing site. This reference image is called a page. A Page is the file uploaded by a developer for analysis so that the object depicted in the file can become a target object; thereby, enabling target tracking of said object. Layar will extract the details of each image to create the unique fingerprint of the object. We will store this as specified in our updated Terms and Conditions. We will keep the page in our database as they might be needed for future improvements of our algorithm. Please check Reference Image Best Practices on how to create good Pages. With Layar Vision, many nice use cases are possible now, for instance, you can put virtual buttons on magazines and these buttons can directly link magazine users to online shops. To see it in action, you can check out this showcase video. We also created a few other demo layers to give you more inspirations. You can find them at the Notes section below. To enable Layar Vision, the following changes need to be made on the layar publishing site. There are two ways to enable Layar Vision. 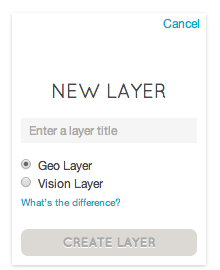 When a layer is created, on "create a new layer" page, an option to enable "Layar Vision" is added. This option can be edited later under the "overview" tab of the "layer editing" page. Once "Layar Vision" is enabled (and settings are saved), a new tab called "Pages" is shown. Developers can add and manage Pages here. Image The image itself that is uploaded from your computer Image resolution must be at least 640 x 480 pixels, though larger images are accepted and encouraged. Supported file types include .JPG, .PNG, and .GIF. File size may not exceed 10MB. Image key The key that is used to identify a reference image. It is the value of "referenceImage" defined in "anchor" object of a POI in getPOI response. 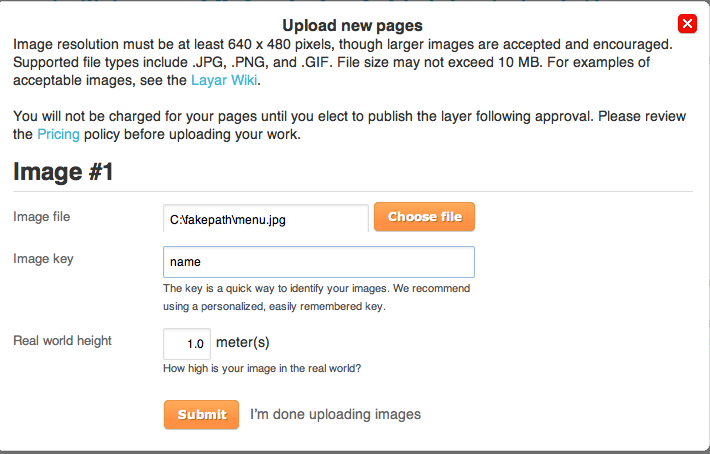 The image key is a quick way to identify your images. It has to be unique for a layer. We recommend using a personalized, easily remembered key. NOTE: After you create an Image Key, the image will be processed by our server and you will not be able to edit it. To change the image or its key, you must delete the original and upload a replacement. Real World Height How high is your image in the real world in meters? Fill in the real height of the target object that you want to augment. This determines how the unit length of the coordinate system is scaled with respect to the target object. So it will determine the size of the augment with respect to the target object and the lengths when "transform" or "animation" are applied to the augment. Once a page is uploaded, they are analysed and based on their quality and clarity of images they can be either rejected or uploaded successfully. Rejected page should be improved and re-uploaded. Once Pages are uploaded successfully, you can attach a 2D or 3D object to a reference image in the GetPOIs response. This can be done in the "anchor" object for each POI defined in "hotspots" object. The key of a reference image for feature tracking should be returned. In the example, it is "myreferenceimage". The detailed description of "hotspots" object in GetPOIs Response can be found here. Publishing site: Creates a layer with Layar Vision enabled and uploads pages to a layer. Image keys are defined. Layar server: Analyzes and extracts the details of each uploaded pages to create the unique fingerprint of the target object. The defined image keys will be used to retrieve the fingerprints of target objects. Third-party developer POI server: Returns getPOI response which contains correct "referenceImage" values. The "referenceImage" value should be one of the image keys defined for that layer on the publishing site. Layar client: knows which target objects to look for, and the associated augments and actions for each target object will be loaded from the layar server. A Tutorial is created to explain how to write a Vision enabled layer. Sample Code written in php is available for downloading at the end of the tutorial. Here you can find some demo layers which show case the new possibilities in Layar Vision. Cantine Doc.pdf, detailed explanation/instructions on how to create the Cantine layer. PHP - All the files that you need to get the web service work. Reference Images - Images need to be uploaded to the publishing site. Images for print - The actual target objects that you can print out. Kitten Edition shows the functionality of Layar Vision through the Internet-renowned image of an adorable kitten who happens to be dressed as Link from The Legend of Zelda. The tutorial focuses on how to create the laser eyes effect !! The complete JSON response of this layer together with the reference images and 3d models are provided here in the attachment. For Vision enabled Layer, by default, a new clue button is added to the camera view to indicate that the user can view the images of the target objects. Once the user selects the button, a "clue" menu is displayed containing the thumbnails of the reference images that are loaded for tracking. Users can use these thumbnails to find target objects. The user cannot click on the thumbnails to enlarge. If there are more thumbnails than can fit on the screen, the user can scroll through them.